Goooooooood morning Vietnam! It's 0600 hours. What does the "O" stand for? Oh my God, it's early! It's been a rough couple weeks. We could all use a laugh. Dana Bierman and Danni Eickenhorst want to help you out with that. This Saturday, August 30, the two die-hard Robin Williams fans are organizing a pajama party, happy hour and Robin Williams movie marathon at the Luna Lounge. The evening comes complete with a red carpet, popcorn and sturdy desk so you can proclaim all the "O Captain! My Captain!" soliloquies till your heart's content. Eickenhorst and Biermann started with a plan to watch a few of Williams' movies at home with a big bowl of popcorn. Somewhere along the line, they decided to add alcohol and jammies and invite all the other Robin Williams fans in St. Louis. All the money from the $5 cover charge will be donated to the Independence Center, an organization that promotes a community environment for people struggling with mental illness. "We just thought people could use a good laugh," says Eickenhorst. "We thought this would be a proper send off for his fans, but also an opportunity to do good." Eickenhorst anticipates they'll get through three of Williams' movies. The first one starts at 5 p.m., and you can vote for which three you want to watch on the event's Facebook page. 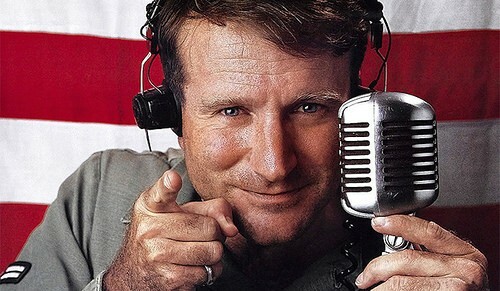 Right now, Dead Poets Society, Good Will Hunting and Good Morning Vietnam are the front runners. Your move, chief.